Thanks for the update Hidenori, and keep up the great work! Read more about their mission HERE. Nice work! Antoni Gaudí (1852 – 1926), most outstanding representative of “Modernisme Catalá” and his idea of nature as a replica of living environment for humans will be presented and the question of why a Catalan architect came up with such radically different ideas of his contemporary collegues. The lectures are in english and italian (simultaneous, chat), will last app. 1 hour and will offer possibilities for questions at the end. We had an outstanding range of community-submitted resources this week! Thanks so much for sharing the inside scoop on these projects, and keep it up! 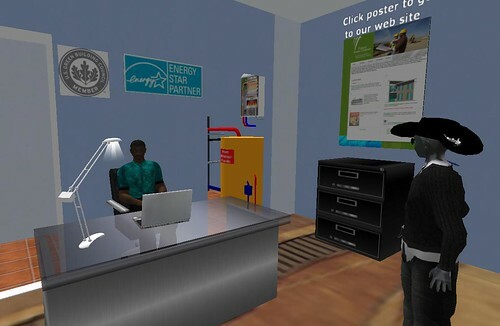 Martin Purnell and Associates, a real life development firm located in Chicago, Illinois, opens virtual office on the Etopia sim in Second Life. 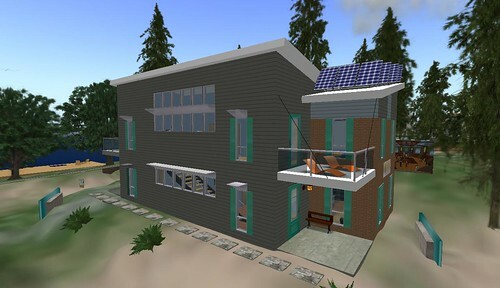 The construction is nearly complete on the virtual model of the Future Green Chatham homes. They hope to begin building the home in real life sometime early next year (click any screenshot for a slideshow of images). 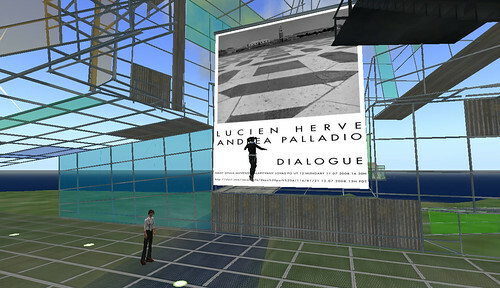 I talked with avatar Luchenpur Darwin, co-owner of Martin Purnell and Associates in real life, who tells me, “the Second Life model gives you a very real sense of how the home will feel. Even traffic patterns.” This project, built by Prim Chemistry on Etopia Island, owned by William Thewise Goodman, is definitely worth a visit! They will be having a Gran Opening celebration this weekend. Guided house tour starts at 4:30pm SLT on Friady, July 18th, with Live performance by Harper Messmer at 5pm SL-time, DJ Imajin Brentano from 6-8pm, and Fireworks at 8pm. They will also have a tour on Saturday July 19th at 4:30pm, with live performance by Vienna James at 5pm, DJ Vivie Durant at 6-8pm and Fireworks at 8pm. Finally, on Sunday, July 20, they will have a guided house tour at 2:30 PM, a live performance by Truelie Telling at 3pm, DJ Yngwie Krogstad from 4-6pm, and Fireworks at 6pm. “Yesterday I invited “Atelier Ten Architects” for my laboratory of Tokyo Metropolitan University, and they made a special lecture of “Architecture in physical world / virtual worlds”. 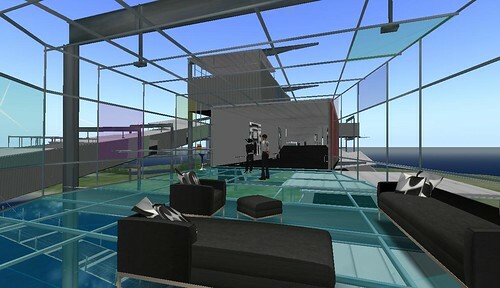 They are “Real” architect that had produced many architectural projects in physical world, and also, they are “Virtual” architect in Second Life, too. In “Digital Design Competition 2007” (I was a jury member), they won the Grand-prix of competiton. 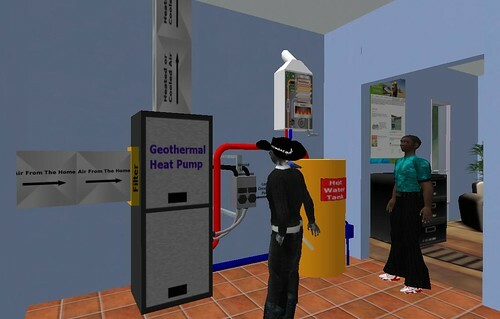 They got a cooperation by a information-technology company “GMO Tea-cup communications inc.”, and realized their idea in Second Life, “The museum of the globe (slurl)”. July 12 at 1pm will mark our preview show and we’d be very grateful if you would join us. One wing of the new gallery will be showing the first 11 peices of the exhibit, more wings will open through the summer months. This exhibit is in tandom with an RL exhibit in Hungary, Herve’s birthplace. Lucien Hervé (b. László Elkán) (August 7, 1910 – June 26, 2007) was a French-Hungarian photographer well known for his black and white photos of architecture. He was born in the city of Vasarhely in Hungary on August 7, 1910, but came to Paris in 1929 and earned French citizenship in 1938. During World War II he was captured by the Germans (at the Battle of Dunkirk), escaped, and became a member of the French Resistance under the name Lucien Hervé which he kept thereafter. He was most famous for his collaboration with the architect Le Corbusier from 1949 to the architect’s death in 1965. His black and white photos of Le Corbusier’s buildings — with their strong lights, shadows, and monumental sense of space — are perhaps the most well known images of the architect’s work. He has also worked with the architects Alvar Aalto, Marcel Breuer, Kenzo Tange, Richard Neutra, Oscar Niemeyer, Jean Prouvé, Bernard Zerfuss, and others. Lucien Hervé also explored photographic abstraction and collage. Since the late 1980s, Hervé’s work has enjoyed a renewed popularity. In 2000, he showed color works of his apartment at the gallery of fashion designer Agnès b. Not long before Herve’s death, Getty bought around 200 of his slides. The artist was married to a Holocaust survivor.